The Pittsburgh Steelers released long tenured and fan favorite defensive end Brett Keisel ahead of the start of free agency and in doing so they ended an era in Steelers defensive line history. We have released defensive end @bkeisel99. Last summer Brett Keisel, age 37, opted to rejoin the Steelers after rejecting an offer to join Bruce Arians in Pittsburgh West aka the Arizona Cardinals. At the time, Keisel signed a 2 year contract. Officially, Keisel wasn’t supposed to start and, strictly speaking, he only “officially” started. But even when Keisel wasn’t starting, he was clearly out playing Cam Thomas at the defensive end position and by midseason he was hitting his stride. It was Kesiel’s pass-deflection-interception which helped push the Steelers over the Houston Texans, in a game which arguably turned their season around. In cutting Keisel, the Steelers saved a reported 1.5 million dollars in salary cap space, which was already modest and dwindling, as the Steelers had signed Arthur Moats to a 3 year contact, signed Matt Spaeth to a two year contract, and tendered offers to restricted free agents Antwon Blake, Will Johnson, and Robert Golden. The move nonetheless leaves the Steelers thin on the defensive line. 5021 days is a long time in any context, but in the not-for-long NFL it represents and eternity. But that’s how long the era of Steelers football on the defensive line that ended with Brett Keisel’s release ended. On September 3rd 2000, Aaron Smith started his first game for the Pittsburgh Steelers. You’ll note that the Steelers lost 0-16 that day to the Baltimore Ravens – in the final Steelers-Ravens match up at Three Rivers Stadium. The game itself felt more the beginning of the end of the Cowher era than the beginning of something far bigger and better. But bigger and better it was. With Aaron Smith the Steelers installed the first piece of a defensive line that would, in some form or fashion, dominate the NFL and win two Super Bowls over the ensuing 14 years. After Smith, their came Casey Hampton in 2001. For the next 5 years the trio of Smith, Hampton, and von Oelhoffen would anchor the Steelers defensive line. The Steelers drafted Keisel in 2002, and he would begin working his way into the line up in 2004, before taking over the starting role in 2006. The trio’s pinnacle came in 2008, when the Steelers defense dominated the NFL culminating in Super Bowl XLIII. Then, as all great units do, the unit began to decline. Injuries struck Smith down in 2009 and then again in 2010 and again in 2011 and then he was done. Casey Hampton was next, bowing out after 2012. Keisel of course hung on for two more years, but now his team in Pittsburgh, if not the NFL, is over. And change is often good. 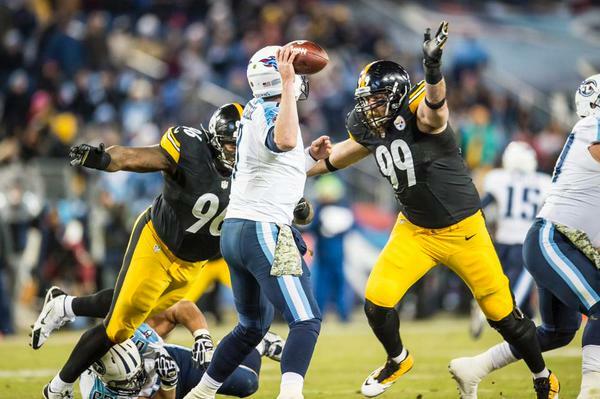 Both Stephon Tuitt and Cameron Heyward give Steelers Nation a lot to be excited about. Daniel McCullers almost classifies as a freak of nature, and Steve McClendon is no slouch. But any day that the Steelers say goodbye to a player of Brett Keisel’s caliber is a sad in Steelers Nation. Brett Keisel Over Cam Thomas? What??? Most observers expected Cam Thomas to be one of the first salary cap casulaties, however, at this time the Steelers have not released the journeyman veteran. Keisel of course suffered a season ending injury in the Steelers loss to the New Orleans Saints, ending his season. There was speculation that the Steelers were waiting on news of Keisel’s recovery to make a choice between him and Thomas. Thomas of course could still be cut, but that would leave the Steelers with little depth on the defensive line, with only Cameron Heyward, Steve McClendon, Stephon Tuitt and Daniel McCullers under contract. The Steelers did enter the 2014 season with Josh Mauro and Nick Williams on their practice squad, but both men were poached by other teams. This entry was posted in Steelers 2015 Free Agent Focus, Steelers 2015 off season and tagged Aaron Smith, Brett Keisel, Bruce Arians, Cameron Heyward, Casey Hampton, Steelers defensive line, Steelers free agents, Steelers salary cap, Stephon Tuitt, Steve McLendon. Bookmark the permalink.